One day, I felt like making something coffee related. 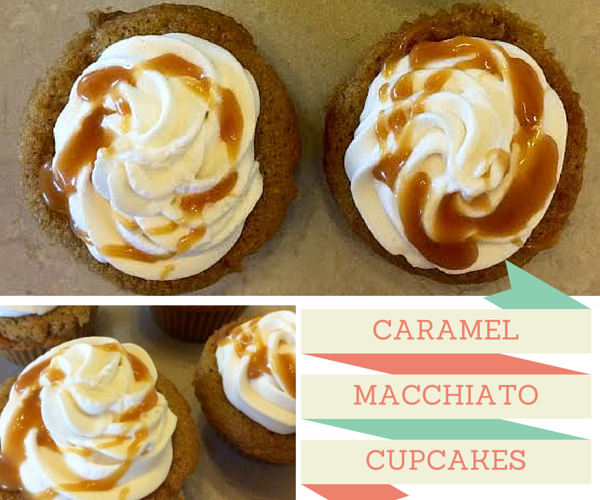 I decided to modify my go-to vanilla cupcake recipe and make my bestie’s favorite drink, a caramel macchiato, into a cupcake. The results were amazing. This is one of my favorite recipes to make and one of everyone’s favorites to eat. Pre-heat your oven to 350 degrees and line a cupcake tin with your favorite liners. Add your instant coffee to your milk and let stand. Mix all your dry ingredients together in a big bowl. In a stand mixer, cream together your butter and sugar until light and fluffy. Add in your vanilla and one egg at a time until incorporated. Alternating flour mixture and milk, add in to the wet ingredients until it's all incorporated. You want to start and end with dry. Scoop your batter into your prepared muffin tins and bake for 20 minutes. A toothpick inserted in the center should come out clean. For the frosting - using your whisk attachment on your stand mixer or a hand held mixer, beat your whipped cream until frothy. Add in your coffee if using. Whip until it starts to hold peaks. Add in your vanilla and your sugar. Whip for another 2 minutes, until it reaches a pipe able consistency. Pipe onto your cupcakes and drizzle with your favorite caramel sauce.